I was the kind of kid who was totally half girly girl, half tomboy (if that makes sense. I grew up with the neighborhood boys running around and rolling in mulch before being sprayed off by the pressure hose, and then I would go put on a ton of lipsmackers. I was the kind of kid who would carry around my cassette tape player with the attached microphone and sing to all of my family's cassette tapes. I killed it with some Garth Brooks and Wee Sing Kids. I was the kind of kid who NEVER wanted to get in trouble. If I did, I used to cover my face with my hands like it was a mask. My parents were mad at the masked lady, not Alex. 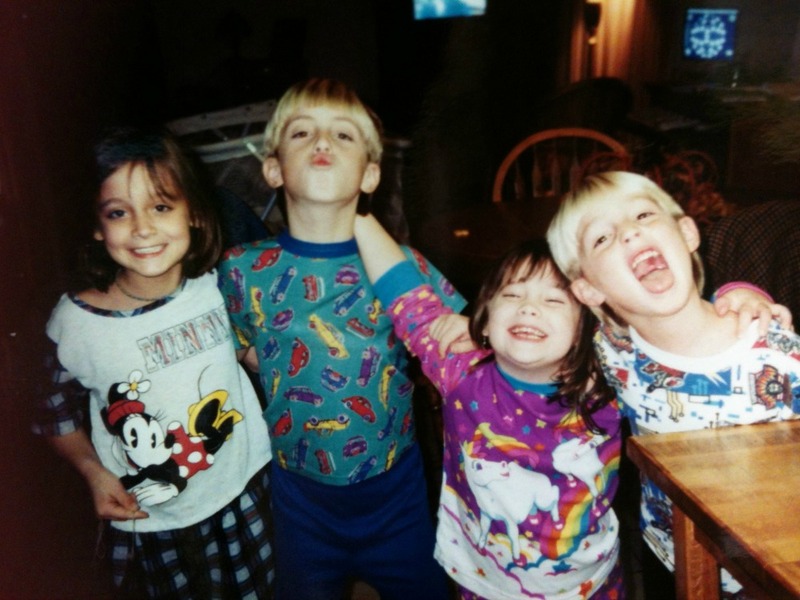 I was the kind of kid who was obsessed with all things Disney. Anything and everything that could be princesses was, and we had all of the VHS tapes. I could recite them all. I would bike around my neighborhood singing "just around the riverbend." I was the kind of kid who, if there was a buffet, would fill my plate to the brim with food. And then probably not finish it. And then go back up for seconds and dessert. I was the kind of kid who wished I could live in the "olden days." I even went to a day camp in the summer where I learned to write with a quill, and how to spin yarn, and walk on stilts. I even got to wear a special dress! I'm such a nerd. 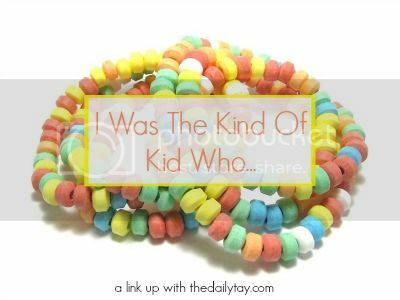 I was the kind of kid who was a total one upper. I remember learning about the Underground Railroad in school, and telling my teacher that we had part of the Underground Railroad in my house (we don't), just so that I would feel special. What a little liar I was. I was the kind of kid who stayed up late with my sister watching re-runs of I Love Lucy. We would laugh so hard, that we would make ourselves cry from laughter. I was obsessed -and still am- with Disney to haha! Also, totally feel you on the lipsmackers - i still get a major urge to buy them haha! This is so sweet! I love the day camp that you went to... that is the cutest thing ever! Doesn't make you a nerd; make you interesting! I loved and still love Disney, thought Part of Your World is my jam. Love this! YESSS to Garth Brooks, ha! ha I love this. Little kid you sounds so sweet. She'd probably be friends with little kid me and we'd watch Nick at Nite together! Haha! I still get sentimental about Nick at Night! Whenever I hear the songs I get all the feelings in my heart. Can you just imagine little girl me with my little microphone walking around "I GOT FRIENDS IN LOW PLACES!!!" We were totally the Disney generation. The Dr. Pepper Lipsmackers was by far my favorite. Or the blue, even though thats not a flavor. Right! I have no idea if they even make them. I should go buy some for my sister, just so I can try them. Disney is the best. Sometimes I break out the videos (yes, my parents still have our old vhs player) so that I can teach my sister of their greatness. And sometimes we sing along.